Ticket registration is underway for key events for the Brave New Voices International Poetry Slam Festival, which brings 600 young poets to campus July 15-18. Most performances are free and open to the public, but attendees must register for tickets. Seats are filling quickly and several events have already reached capacity. Jamie Weems doesn’t consider herself a poet. But there are hundreds of them that she’d like you to meet. This summer, Weems is playing a pivotal role in bringing some 600 young poets to Emory for the 2015 Brave New Voices Festival, July 15-18 — four days of poetry workshops, special events and performances that culminate in an acclaimed international youth poetry slam. Many events are free and open to the public, including an opening ceremony on Wednesday, July 15, from 6 to 9 p.m. at the Glenn Memorial Church, but registration is required for most events. Tickets are necessary for the Grand Slam Finals competition, which will be held Saturday, July 18, at 8 p.m. at Atlanta Symphony Hall in the Woodruff Arts Center. Helping to promote the power of young poets has been an unexpected journey for Weems, who serves as an administrative assistant to Emory University Librarian Yolanda Cooper. It’s a pathway that actually begins with a connection that stretches back to her childhood in Ithaca, New York, and Hodari Davis, executive producer of the festival and a lifelong friend. 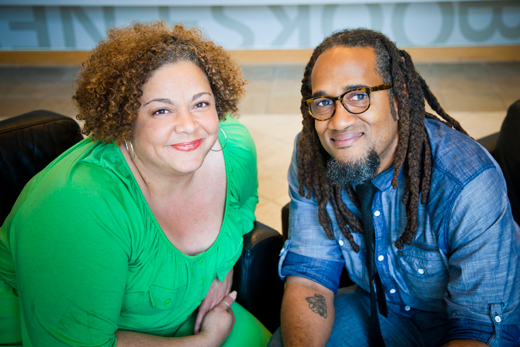 Davis recently visited Weems on campus to prepare for the upcoming festival, so Emory Report caught up with the two friends to talk about poetry in the lives of young people and what brings Brave New Voices to Emory this summer. Weems: Hodari is someone I went to elementary school with back in Ithaca, New York. His mother, Laroilyn Davis, is a gifted educator who taught black history through poetry and performance with a program she founded called Young, Gifted and Black. Davis: I grew up performing — lots of poetry, lots of public speaking. My strongest memories from childhood are of being on stage right before the curtains opened. But it gave me an appreciation of poetry, African American history and the passing on of culture. How was the Brave New Voices Festival created? Davis: James Kass was a student at San Francisco State University who was disillusioned with how poetry was being taught to young people. Rather than alienating them, he was interested in opening doors to share stories and redefine what it means to be a poet and to write poetry. The most radical thing was to give them a microphone and permission to share their stories. That was the beginning of Youth Speaks, an organization that helps young people develop their voices as creators of social change. In 1996, the first Brave New Voices was held with only about four teams. We’re now on our 18th festival representing more than 70 organizations from the U.S. and abroad — over 600 young poets who will come to Emory to share their words together. Jamie, how did you become involved? Weems: In 2009, Hodari asked me to be an adult chaperone and help organize the trip for a group of students from Atlanta (ages 13-19 with Atlanta Word Works) to attend the Brave New Voices Festival, which was in Chicago. Most mentors were educators or poets and had experience with this. I’d never worked with youth in that capacity. It was life changing. I was so impressed with their dedication and how much work they put into it and began wondering if there might be a way to bring this to Emory. In 2010, the festival was in Los Angeles and I agreed to help out again. I remember walking in downtown LA with the Atlanta team saying, “You know we want to have Emory host this in Atlanta?” And five years later, here we are. What do you find special about the festival? Weems: The energy, the excitement. For many of these young people, this is the first time they will be completely surrounded by poetry. And there is a fellowship that comes with that. Nowhere else will you find 600 kids up talking poetry in the middle of the night. They are exposed to new cities, meeting kids from all over — India, Ireland, South Africa. There is tons of exposure, and it’s also an opportunity to work with world-class poets and writers — a good day-and-a-half of workshops. There is no prize for the Grand Slam Finals, so the emphasis isn’t on competition. It’s more about fellowship and camaraderie. Everyone is cheering for whomever is on stage. Davis: The poetry slam draws them into a space to be in community with each other, to teach artistic engagement, literacy development, how to use your art as a tool of change. They are learning about values, how to interact with each other, but all of that may not become fully apparent until the festival is over, when they realize the most important thing about the week had little to do with competition, and more to do with interactions and encounters with people far outside their own communities and neighborhoods. Then going back to the Pine Ridge Reservation, or Alaska, or the south side of Boston, or rural Georgia after you experience this euphoria, this utopia, this living community. It’s hard to go back home and not be changed. Will these young poets also have a chance to engage with materials at Emory’s Manuscript, Archives and Rare Book Library (MARBL)? Weems: We’re going to offer a workshop that Gabrielle Dudley (instruction archivist and QEP librarian) and Pellom McDaniels (curator of African American collections at MARBL and professor of African American studies) are creating using materials from MARBL. Gabrielle, along with other MARBL staff, will lead the workshop. Davis: Knowing that they’re coming to the place with an archive where many of the papers of Langston Hughes, Alice Walker and Lucille Clifton are kept, I’m hoping our poets will be inspired to take their words and journals even more seriously, to see that a poem is stuck in time, an artifact of who you were. I’m hoping this archive and experience with the library will inspire them to be better caretakers of their own words and the materials they use to record them. I don’t know a better way to do that.